This week we are attending the main cloud native conference, KubeCon North America in Seattle. The conference continues to grow, and we expect over 8K attendees, up from 4.1K people at KubeCon Austin in December 2017. We’ve attended the conference for a few years so decided to analyze conference talk categories over time to identify market themes. The number of talks has tripled over the last three years, and the most popular talk categories, like operations, suggest the market is reaching maturity. We cataloged and tagged KubeCon North America talks from 2016–2018. We included featured talks but did not include keynotes, birds of a feather, lightning talks, trainings, workshops, and working groups in our analysis. Over the past three years the number of talks has tripled from about 50 to 150. There was a significant increase in discussions from 2016 to 2017, while the growth from 2017 to 2018 is minimal. One explanation for the limited year-over-year growth are the numerous targeted break-out conferences co-located at KubeCon like EnvoyCon. These talks are not included in our analysis. The number of talk categories has tripled, in line with total number of talks, suggesting expanded community interest. Operations has been the most popular category over the past three years. Observability and customizing/extending Kubernetes has increased in frequency suggesting businesses are running Kubernetes in production. Since Kubernetes is becoming the default orchestrator, individuals are trying to learn how to extend it to interoperate with other technologies. Additionally, the increase in CI/CD talks year-over-year suggests businesses are deploying services to Kubernetes in production. There are also new categories this year including networking, performance, and runtime. Some categories have fewer talks this year including containers, hybrid cloud, Kubernetes 101, and in production. We believe the decrease in beginner talks suggests Kubernetes adoption has moved beyond the bleeding edge to be more mainstream. The lack of in production talks suggests there are enough examples of businesses running Kubernetes in production that the content will be embedded into other discussions. Companies running Kubernetes in production are no longer a novelty. The number of service mesh and security talks decreased year-over-year. We believe the data is misleading because the two topics have increased in such popularity there are two co-located all-day summits focusing on these technologies. We were surprised to see serverless and storage discussions flat year-over-year. 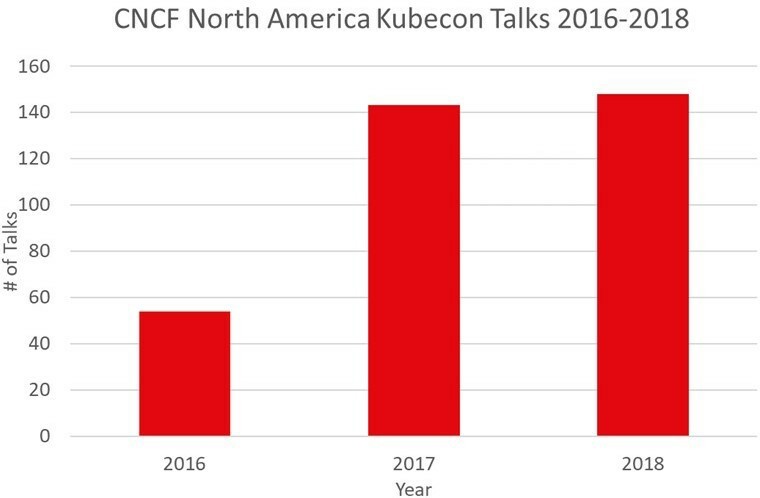 Overall, KubeCon has seen incredible growth over the past three years. The large number of talks discussing operations, observability, and extending Kubernetes suggest businesses are running the technology in production. The de-emphasize of beginner talks further underscores Kubernetes maturity. Redpoint has been active in the cloud native space as a co-author of the landscape and event co-host so it has been wonderful to watch the proliferation of projects and users.